If a building is to be strong, its foundation must be strong. The foundation on which you develop your concepts has to be fool proof. I write this just to make you aware of the importance of basic things in physics. One who is well versed in fundamental principles of physics can easily solve problems in physics which, at the first glance, may appear to be tough. where G is the constant of gravitation M is the mass and R is the radius (of the planet or star). [The above expression is obtained by putting the total energy (sum of the kinetic energy and the gravitational potential energy) of the projected body equal to zero : ½ mV2 – GMm/R = 0]. “So I have to equate the speed of light to the esacpe velocity. Am I right?,” he asked me. “Absolutely. If the object is to become a black hole, the escape velocity has to become the velocity of light c,” I answered. This will will work out to about 0.9 cm. The correct option therefore is (c). [You cannot strictly treat a photon as an ordinary material particle since its rest mass is zero. The entire energy of the photon is kinetic and you have to obtain the escape velocity from the equation, mc2 = GMm/R so that c =√(GM/R). The order of magnitude of the radius is still given by option (c)]. A time varying force F acts on a body of mass 2 kg initially at rest. The nature of variation of the force is shown by the semicircular curve (Fig.). If no other forces act on the body, what will be its velocity at the instant t = 2 s? “Sir, I think I can work out this problem using the concept of impulse,” my student said. “You are on the right path,” I answered. “Probably the question setter had the idea of distracting students like you,” I told him with a smile. “The shape of the curve is semicircular, but it is really a ‘semi ellipse’ since the scales on the two axes are different. Even the quantities are different. One is time while the other is force. So the area is not the area in the real sense”. 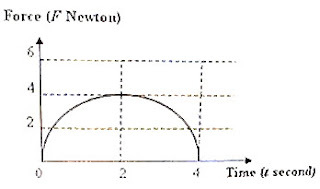 “So the impulse received during two seconds is equal to a quarter of the area of the ellipse with semi major axis (a) equal to 4 newton and semi minor axis (b) equal to 2 seconds. Am I right?,” my student asked. “Absolutely,” I answered. “The impulse received is πab/4 = (π×4×2)/4. This works out to 2π”. “I got the answer,” my student said. “Since the body started from rest the change in momentum of the body is equal to its momentum itself and is equal to the impulse 2π. Since the mass of the body is 2 kg, its velocity at the instant t = 2 s is 2π/2 = 3.14 ms–1, very nearly”. 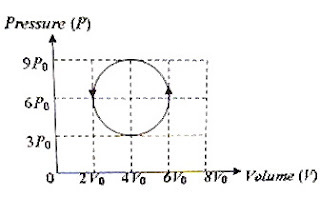 The PV diagram of one cyclic of operation on an ideal gas is shown in figure. What is the net amount of work done by the gas during the cycle? The process shown by the conventional PV diagram is anticlockwise which indicates that more work is done on the system while compressing the gas. The net amount of work done by the gas is therefore negative so that the correct option is – 6πP0 V0.